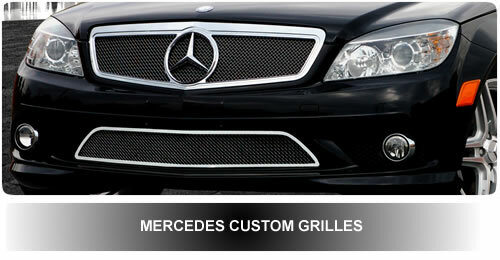 If your looking for an awesome upgrade, why not install a brand new cusom grille for your Mercedes! We carry a complete line of aftermarket custom grilles for Mercedes C Class and M Class models including billet grilles, mesh grills and a choice of finishes such as polished, chrome or cool black. We give you better products at better prices along with better customer service. We carefully choose each of our manufacturers for Mercedes custom grilles based on the quality of their products, appearance, reputation and ease of installation. Browse our selection of Mercedes aftermarket grilles and accessories which includes billet grilles, chrome mesh grilles, aftermarket grilles and dash kits.